Mocha AE not respecting layer order! I am a bit of a Mocha novice, though I know my way around the basics. Using Mocha in AE2018, I was always able to get good tracks by tracking foreground objects, and then disabling the gear icon, and then tracking occluded objects behind them. For some reason, AE2019’s MochaAE will not respect this layering. I can track my foreground just fine, but my BG track still tries to track where the FG occludes it… despite turning off the FG object, and even locking it. Extremely annoying. Wondering if anyone has experienced this or has a fix? I have tried disabling GPU, and no fix. What are you tracking and what hardware are you running? Are you able to post a screen shot? I’ll post a screenshot later tonight. 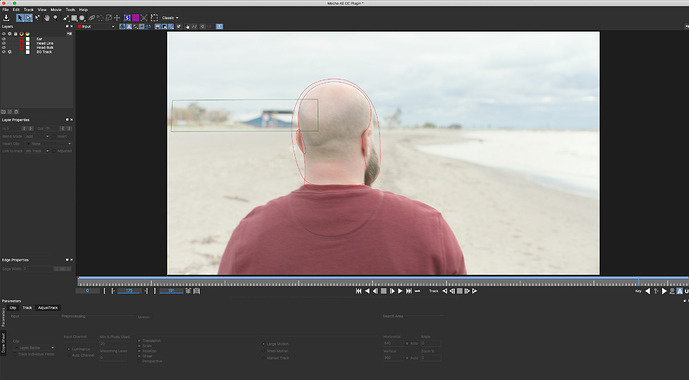 I am tracking 4K 444 Prores Footage. Back of someone’s head as they walk on an out of focus beach. Working from latest OSX build of Mojave, 2014 Mac pro. 6 core intel Xenon E5. 64GB ram, 2x D700 Fire cards. Here is the setup i am using. Trying to track BG layer, but it wouldn’t initially respect the stacking order. HOWEVER, I discovered that in this exact set up, it will, but with ONLY the bulk track (hadn’t done the fine head and ear track) it wouldn’t. Is it possible single layer occlusion could be messing up, but not multi layer? Hmmm… possibly! We’ll investigate. Thanks! Do any of these layers have different blend modes?